Traditionally, we would use calamansi, but I used bottled lemon instead. I think calamansi, although it's a citrus, is sweet in comparison to lemon which has a slightly bitter taste to it. Filipino stores sometimes sell calamansi. I have yet to buy me a tree and plant me my own calamansi shrub. Time to go to OSH (Orchard Supply & Hardware) and find me one. This is one of those recipes again that I don’t ever use a measuring device other than my taste buds, and where, a little bit of this and a little bit of that is my gauge. In fact, that’s how I cook most of the time. So I hope this turns out good per the following measurements. A few slices of brown or white onions. 1. Combine soy sauce and lemon. I always use my taste buds here, the taste should be a good blending of soy sauce and lemon. You want to taste the lemon, but you don’t want it too sour. 2. 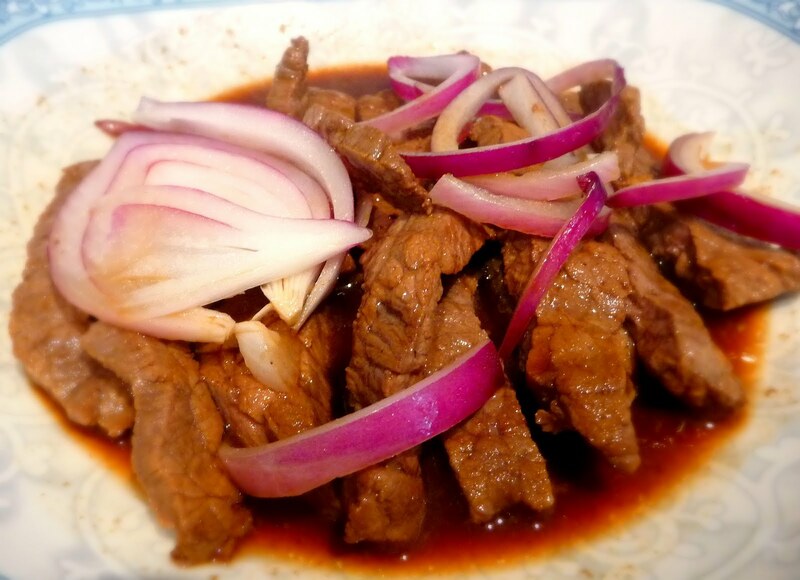 Marinate the beef in the soy sauce mixture for 15 minutes on each side. 3. Heat up cooking oil on medium high heat until oil is hot enough for searing. Sear the beef for about 5 seconds on each side. 4. Cut up the beef into 1/2-inch strips. Pour the soy sauce marinade into the same pan. Add the beef slices. Cover the pan and simmer on low for about 5 minutes or so. You don’t want to over simmer or the beef will get tough. Cook it just enough so the beef is still tender but not red on the inside. 5. Cut the onions into rings and add it on top of the beef about 4 minutes into the simmering time and cover the pan. The steam inside the pan will release the flavor of the onions into the dish while keeping the onions crisp. If you prefer cooked onions, place them into the sauce instead of on top of the beef. Serve with rice. Three strips of sirloin tip marinating 15 minutes on each side. Seared very briefly on each side, and cut into 1/2-inch strips. It's OK that the inside of the beef is still red. You will still simmer this in the final procedure.